By Chloe is the cool, on-trend new addition to London's vegan scene, but don't expect a long, boozy occasion. 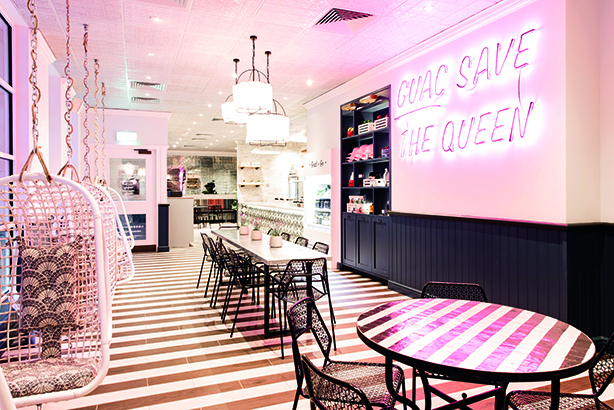 By Chloe is an American import – it is a cult in SoHo, NYC, and has a huge vegan and 'cool dude' following. There was quite a stir when it announced its arrival in the UK. It is effectively a fast-food outlet for vegans with ‘takeaway cutlery, order at the counter and eat from the carton’ as its service culture. The décor is modern floral with swing chairs and sharing tables, but you can sit down and the food is brought to the table. It is for young clients and influencers, vegans and the culturally curious. We took PRWeek’s resident vegan, John Harrington. The classic burger is the mainstay here, a tempeh-lentil-chia-walnut patty (I said it was for the culturally curious…) served with pickles and the usual trimmings (except dairy cheese, clearly). They do a selection of vegan takes on US classics – mac and cheese, pesto meatballs and quinoa tacos. As a nod to the locale they also serve ‘fish ’n’ chips’ and shepherd’s pie. Chips are either original or sweet potato. Beet ketchup is de rigueur, as is the kale salad. Our bill for three, with various soft drinks and lots of sharing dishes, was £57. No service charge was added or expected. Get there early to await your guest – tables are not reservable and it gets packed. Pick the smaller central tables and you’ll be the envy of all arriving and queuing. Try a bit of everything and share. No alcohol is served, so don’t expect a boozy afternoon – you’ll be in and out in an hour max. It’s very buzzy, cool and youthful, so if you want to impress as an on-trend insider, this will hit the spot. Smart, chic and luxe it is not.